"I don't want to go back," Lucinda Donley, one of the attacked workers told News 4. "I don't feel I'm protected on the train"
Police released video of a suspect in two attacks on female MTA workers. Wale Aliyu reports. 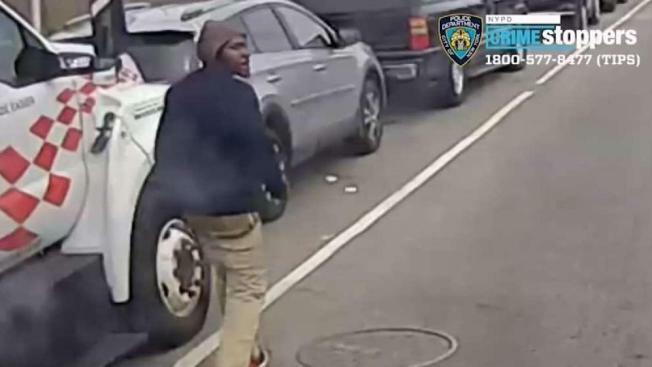 Cops are looking for a man they say threw urine on two female MTA workers -- a subway conductor and a bus driver -- in the Bronx within a span of an hour last week. The foul spree has a union demanding increased police presence -- and at least one of the victims fearful of returning to work. Lucinda Donley was the first victim. She was the conductor on a Bronx-bound No. 6 train around 10:30 a.m. Friday and told News 4 she saw the suspect get on her subway in Harlem. At the time, she noticed he was holding an empty water bottle. Every time the train stopped, the man got off for a minute and looked at her before boarding again, Donley said. When the subway pulled into Brook Avenue, Donley says she saw him get off the train. This time, the water bottle was filled with yellow liquid. Donley said the man stopped and "stared at me dead in the face," cursed at her -- and threw the contents of the water bottle at her. Then he punched her in the head and ran off. She said she was drenched; she was wearing safety goggles at the time so her eyes were protected, but her black scarf and one side of her face -- soaked. "Honestly I don't want to go back," Donley said. "I don't feel I'm protected on the train." An MTA bus driver describes the attack, which her union says is part of a growing problem. Wale Aliyu reports. About an hour after Donley was attacked, police say the same man threw liquid at an MTA bus driver about 15 blocks away on Grand Concourse. This time, he was holding a coffee cup, surveillance video showed. The victim, Trelles Robinson, had no doubt about what was in the cup. "It was urine, from the stench," she said. "It's the lowest thing you can do to someone." The union that represents MTA workers said it was telling bus drivers to keep their windows closed, reminding train conductors to wear safety goggles and advising they shut their window if someone approaches. The group also called for more NYPD presence in subway stations and isolated bus stop areas. NYC Transit President Andy Byford released a statement Sunday saying, "These senseless attacks are disgusting and disgraceful." "I’ve asked NYPD to step up patrols in response to the subway incident in addition to our prior request to increase police presence on buses, and we will do whatever we can to help NYPD identify the perpetrator or perpetrators including sharing any video surveillance that may exist," Byford added. Anyone with information about the attacks is asked to call Crime Stoppers at 1-800-577-TIPS.